Capital One is a major financial corporation based in the United States, and offer financial products for both retail and business customers. Capital One’s products range from credit cards, checking accounts, savings accounts, certificates of deposits, small business banking, commercial banking, mortgages, home equity line of credit, auto loans and investment banking. The company serves thousands of businesses with its vast array of products such as business credit cards, business checking accounts, business loans and 401K accounts. 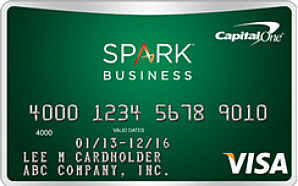 Capital One’s Spark Cash Credit Card is ideal for businesses looking for savings via cash back rewards. The major benefits offered by the Spark Cash credit card include 2% cash back on purchases, chance to earn extra $300 in bonuses, unlimited amount of cash backs and rewards without expiry dates. The card pays a bonus of $250 after spending $5000 on purchases within the first 3 months. The cash rewards may be used for any purpose and do not expire. The card also offers additional $50 in bonuses for signing up employees. The Spark Cash credit card comes with 0% APR for the first year. The card is branded and powered by Visa. Visa offers a $0 liability protection from any fraudulent purchases. A 90-day purchase protection is also available as part of the Visa benefits. Additional benefits from Visa include damage waiver for auto rental collisions, extended protection services and travel & emergency assistance. The card also comes with the award winning customer service from Capital One. You can apply for a new card online or by calling the customer service. You can contact a card specialist from Capital One on questions related to the application, card payments, disputes, transaction history, etc. Typically, a new card is issued within 10 business days for new applicants. You can also enroll in online banking to view transactions and make payments online. The cardholder may contact customer service to request a change in the payment due date. You can also seek assistance from the customer service to setup a balance transfer from another card. Capital One also provides an year-end summary of all the transactions to help you with the tax planning and tax filing. Capital One charges $59 in fees after the first year. The APR on regular purchases varies between 13.9 percent and 20.9 percent depending on the cardholder’s credit rating. The same APR applies for balance transfer as well. The APR is tied to the prime lending rate. The APR for cash advances is currently 24.9 percent. The penalty APR for late payments is 29.4 percent. Interest is charged on new purchases after the closing of the current billing cycle. Interest is charged immediately on cash advances. Capital One charges $10 or 3% of the amount on all cash advance requests. There is no transaction fee on balance transfer requests. Capital One does not charge any fee on returned payments and over-the-credit limit transactions. Apart from the $59 annual fee after the first year, there are not many cons associated with the Spark Cash credit card from Capital One. The fee charged by Capital One is lower compared to similar products from lenders such as Amex or Citi. The Spark Cash credit card from Capital One offers a ton of benefits for businesses. The excellent rewards program backed by Capital One is great for businesses looking for every day savings.